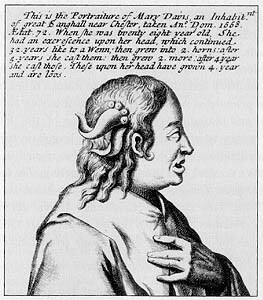 "We were then shown a very an extraordinarily curious horn which had grown on the back of a woman's head. It was exactly like a horn, except that it was thinner and browner in colour. It is somewhat of a curiosity and it appears that men-folk bear their horns in front and such women theirs behind. It was noted on a label that it originated from a Mary Davis of Saughall in Cheshire an aet. 71 an. Dn. 1688. No doubt it will have been mentioned in the Transactiones Angl., or in the Hist. nat. of Cheshire. The horn was blackish is colour, not very thick or hard, but well proportioned." Early visitor to the Musaeum Tradescantianum (The Ark).